I love Fattoosh salad, especially on a hot summer day. Last week we were blessed with sunshine and I had this salad for three consecutive days. 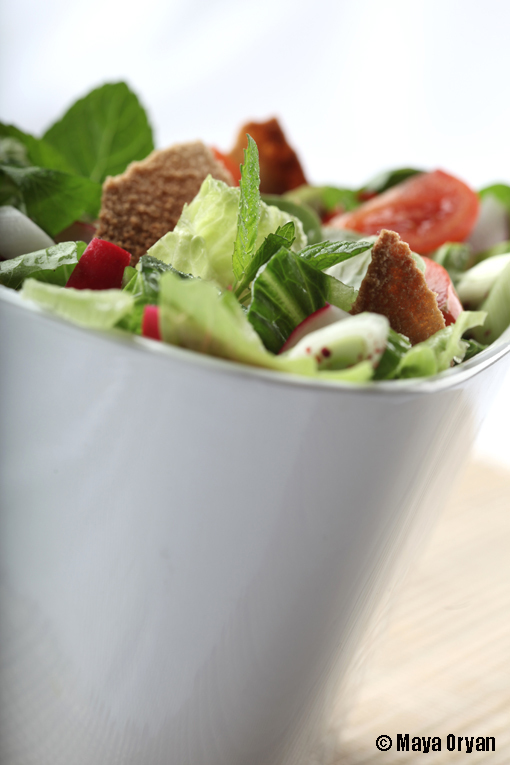 Fattoosh is a Lebanese salad, simple comme bonjour, there’s no secret on how to make it. The distinctive ingredients are sumac, purslane and toasted pita, while everything else is usual. In a large salad bowl, mix together the lettuce, cucumber, tomatoes, capsicum, radish, green onions, parsley, purslane and mint. 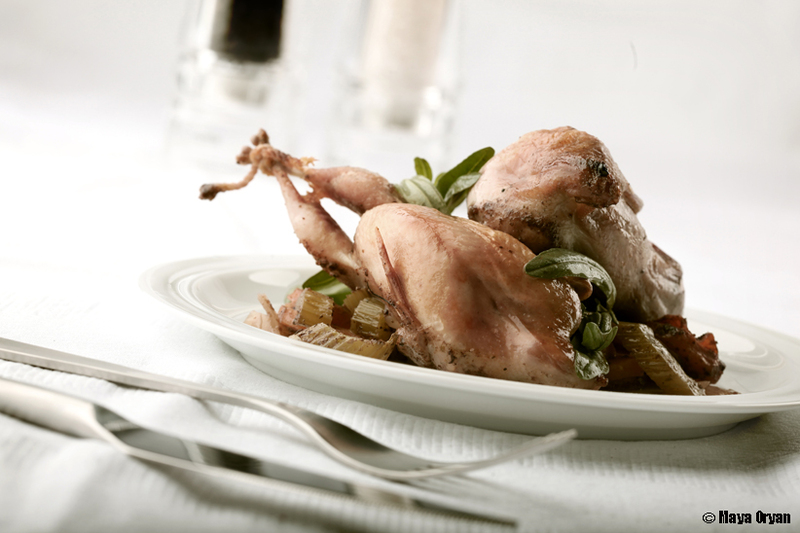 Toss with the dressing, and serve with toasted (or fried) bread at the last minute. Another Lebanese Dessert, the Snayniyeh! Lebanese are very special when it comes to languages. I, like many Lebanese, speak to my daughter in French, send her to a school where she learns English and Arabic and lives in a country where the spoken language is Lebanese. Gulf countries have a translation for every foreign word while we Lebanese have our own mishmash of languages, we don’t mind speaking 3 languages in one sentence; if it’s a computer then let’s call it a computer and not “hassoub”, and if French call it Filet, don’t think hard, everybody knows what Filet de boeuf is. I love this! It’s not complicated! So when Kaia, asks me: “Mom what is cheese in Arabic?”, I proudly answer: “Jibneh”, but if she asks: “What is Cheese Cake?”. I answer: “It’s Cheese Cake!” Who knows what Gateau jibin is! Fair enough, no? Italians have Tiramisu and Panna cotta we Lebanese have Snayniyeh and Meghleh. Why try calling it anything else! Every name hides a little story behind. 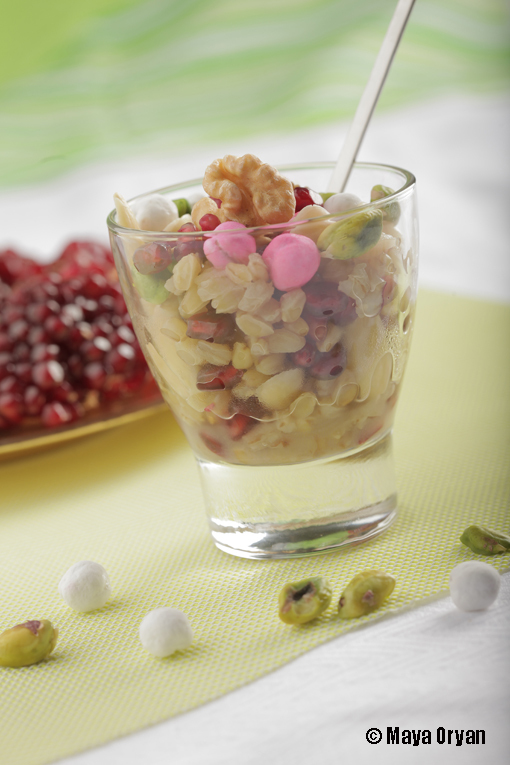 Snayniyeh is derived from “snan”, which means teeth in Lebanese and this scrumptious dessert is usually prepared to celebrate the appearance of a child’s first tooth. A sure phenomenal event for every mom! 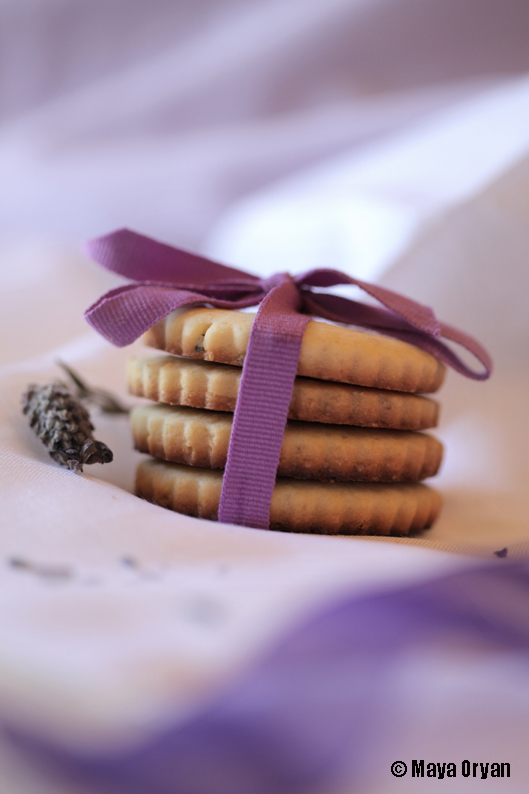 The name Snayniyeh put a smile on many faces as it brings back sweet memories! It’s simple and healthy and this is how I make it. Cook the wheat in boiling water for an hour or until tender and all the liquid has been absorbed. Remove from heat and stir in icing sugar and orange-blossom water. Mix with the pomegranate seeds. Scatter the rest of the ingredients on the top and serve hot or cold.